With much of the drama largely over and the merger going ahead, a few days ago Dow Jones and News Corp filed preliminary documents outlining the merger of the two companies. The filings, which are required under securities law, are extensive in length, “preliminary” in form and heavy on legalese, but they provide an incredibly detailed window in to the events leading up to the merger announcement as well as the terms eventually agreed on. The documents show, behind the scenes the soap opera characterized in the board room barely scratched the surface of the true level of corporate intrigue. Though the news of the proposed merger didn’t break until May 1st, communications between the companies was ongoing for at least 6 weeks prior. The process began on March 14th when Rupert Murdoch reached out to Dow Jones CEO Richard Zannino. 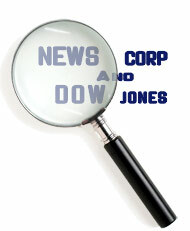 Through April, News Corp finalized its offer internally and presented it Dow Jones. Shortly after the news hit the press, several other companies expressed interest getting involved. Around May 7th, at least three public companies contacted Dow Jones about either getting involved or doing a joint venture. Then, between June 7th and July 27th, another 18 companies contacted Goldman Sachs to express interest. There was also an offer from an individual referred to as Mr. E, who based on public disclosures throughout the deal was presumably Brian Greenspan, former founder of MySpace. Mr E was representing an investment group that proposed to buy 25% of the outstanding shares at the same price offered by Murdoch ($60) along with $250m in stock directly from Dow Jones in exchange for two board seats. On July 30th, the offer was sweetened with the suggestion of an added share buyback and investment of up to $600m in added capital. All said and done, before the deal was settled, two board members resigned and there were at least 23 other interested parties besides News Corp. None of their offers, however, were deemed to be competitive with News Corps’. Here’s a look at a few of the other elements of the deal. (Note: For those interested in the deal history, the Wall Street Journal has published the complete chronology in a format far easier on the eyes than the SEC’s complete merger documents. v. Nicholas Negroponte, former chair of MIT’s media lab and found of Wired magazine. They will serve for 5 years but the appointments will be classified or staggered so that they expire in different years; initially 2012, 2013 and 2014. Thomas Bray will chair the committee. The committee will be responsible for hiring and firing the Managing Editor of the Wall Street Journal, the Editorials Editor at the Wall Street journal and the Managing Editor of the Dow Jones Newswires. The Managing Editor of the Wall Street Journal will have the right to be consulted any usage of the WSJ or Dow Jones brand names by News Corp but ultimately the decision on where, or when, to use the brands will belong to News Corp. In other words, the editor of the journal is guaranteed a podium to complain from, but has not further promises. For the purposes of the merger, the Dow Jones assets will be rolled into an LLC. Murdoch, David DeVoe, CFO of News Corp, and Lawrence Jacobs, News Corps general counsel will sit on the Board of Managers. For ceremonial purposes, since it’s not really an operating role, and to meet legal requirements, Peter Chernin, President and CEO of Fox Interactive Media will take the title of president and CEO. A Bancroft family representative (the Bancroft’s had voting control of Dow Jones) will be nominated for a seat on News Corps Board of directors, and Murdoch entered a separate voting agreement insuring his family will cast their votes for that representative, for the next ten years. If the terms of the Merger Agreement aren’t met by May 1, 2008 (or August if the only hold up is antitrust or equivalent international regulatory issues), Dow Jones will pay News Corp a break up fee of $165m. The complete merger documents, which are available on the SEC’s Edgar database, provide an exhaustive further look into the deal for those so inclined. See also here.